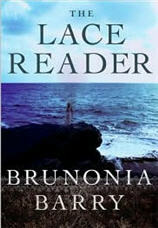 I was lucky enough to win this beautiful copy of The Lace Reader, by Brunonia Barry from Book Club Girl. Thanks Jennifer! It took me awhile to read it. After reading a couple of pages I realized that this was one of those books that I would need to devote all of my attention to. Not because it was difficult to read, but because the story deserved that. Undivided attention. Not something that is readily available in my house. So when I fell ill yesterday and had to spend the day on the couch, “resting”, I thought.. now is the perfect time. The story takes place in Salem, Massachusetts and centers around Towner Whitney, who has returned home due of her Great Aunt Eva’s unexplained disappearance. Eva is the town’s original Lace Reader. She makes lace and then reads the lace as a way of predicting the future. In addition to Eva, we have May, Towner’s mother who lives on Yellow Dog Island. May lives with a group of women who have come to her in need and uses the island as a way to protect them. This includes Towner’s Aunt Emma, who has been blinded by her husband and left with brain damage.There is also Ann, who is part of a different “circle” of women who practice love spells but her and her group are often mistaken for witches by the tourists in the area. Towner has issues of her own. She lives in the city, but has been battling her own demons in between bouts of mental illness and shock treatments. Her return home, and her “visions” concern the people around her because they know her history and what she has been through. She experiences gaps in memory, partly because of the treatment she has endured. She is also grieving over the suicide of her twin sister, Lindley which she has never quite recovered from. This story is rich with detail, but none of it seemed unnecessary or gratuitous. Sometimes when writing about characters that are part of the same family, there is a blurring of lines as to where one begins and another ends. I did not get that with this story. I felt that although many were indeed relatives, each character had its own identity and complexity. I wanted to know more about each of them and more importantly, I cared about what happened to them. As Towner tries to piece together what has happened to Eva, she comes to terms with much of what has plagued her and we see “hope”. The Lace Reader is a whirlwind of thoughts and emotions. It’s a mystery with a tad of historical fiction thrown in. I was completely absorbed by the story and although there is an expectation to suspend disbelief in a couple of places, I gladly did so without hesitation. I think this book would be a fantastic pick for book groups. If you want to know more about the book, check out this Border’s site. It includes a video interview with Brunonia Barry, an excerpt from the book, the reader’s guide and also some history on Ipswich lace. If you’ve already read the book, what did you think of it? By the way, if you want In the Woods, I’d be happy to pass along my copy. Email me at fizzybeverage at gmail dot com. I haven’t read it, but I own it and am really looking forward to it! I can’t wait to read this one. There’s been such a buzz about it. None of the author’s recent interviews mention a trilogy. I sure hope it exists though. I enjoyed it so much.